Actually, this Monday isn't dark at all; it's the 37th Annual Carbonell Awards ceremony at The Broward Center for the Performing Arts. So it's fitting that today's "dark" theater is the Amaturo Theater, where the ceremony is being held. 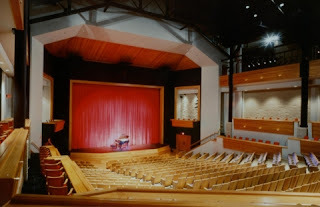 The 21 year old, 590 seat theater may be the busiest venue in South Florida, hosting 2 performances of children's theatre productions for schools most mornings, then changing over to do concerts, dance recitals, and off-Broadway plays in the evenings. Over 2 million Broward Schools students have attended productions at the Broward Center under the auspices of the SEAS program, most of them in the intimate Amaturo Theater. We lead with stories about tonight's ceremony. The Drama Queen announces that the George Abbot Award for Outstanding Achievement in the Arts will be going to Mario Ernesto Sanchez, founder of Teatro Avante and the International Hispanic Theatre Festival. I've worked with Mario on the Festival a few times over the last 15 years, and I can think of no one more deserving of this recognition. Congratulations! Also announced; the Ruth Foreman Award is going to Actors' Equity Association (AEA), celebrating its 100th anniversary this year. The Miami Herald also reports on the fashion aspects of what the local arts community has come to call "theatre prom." We are sad to report that Ken Clement will not be attending the awards this year; his own bold fashion choices have ranged from a faux Zebra tuxedo to a dashing formal kilt, all carried off with great elan. All we can manage is a tux. Wondering who the award is named for? George Schiavone created this video short outlining the works of sculptor Manuel Carbonell that gives you a sense of the man's work. Florida Theater On Stage reports that Costume World is taking over The Caldwell Theater. You may recall that the nation's largest theatrical costume supply house was negotiating with The Stage Door Theatre a few years ago. The plan for the renamed Wick Theatre is to mount a six-show season of classic Broadway musicals with some straight plays, staffed with both Equity and non-Equity performers. She guestimated the annual operating budget for the theater at roughly $1 million, although the figures still are being developed. The operation will start out as a for-profit company while Costume World invests start up cash, but the plan is to seek non-profit status, Wick said. The company will be moving its Broadway Collection Museum to the Caldwell site. Broadway World interviews Janet Dacal, the Broadway star who flew in to fill in as Nina in the Actors' Playhouse production of In The Heights on literally a day's notice. Janet finished her stint covering for Sarah Amengual, but the show runs through the rest of this week, and it's worth catching. You also missed Janet in Broadway Unplugged at the South Miami-Dade Cultural Arts Center. The Miami Herald reports on the importance of the costuming in Priscilla: Queen of the Desert, opening this week at the Arsht Center. Palm Beach ArtsPaper reports that the hot show in The Kravis Center line-up for 2013-14 is Warhorse. Of course, it's also the hot ticket this year at The Broward Center, where it will be playing this May. So you can see it... well, you know. Broadway World interviews Rachel Bay Jones, in previews for Pippin's Broadway revival. Jones started her career in South Florida, working at venues ranging from the Ruth Foreman Theater to the old Florida Repertory Company. She's been back many times, creating unforgettable roles at Florida Stage and Actors' Playhouse, among others. National Public Radio reports on the end of the 70 year old Living Theater, the original off-Broadway company. Surving co-founder Judith Malina closed the doors, and moved into assisted living. The company's website is still up, so we took a quick look. What can sum it up better than this? to cry "Not in my name!" It was a company that always existed on the edge; artistically and financially. We can moan about the loss of Florida Stage and Caldwell Theatre, and rightfully so, but they existed a fraction as long as the Living Theater.